Vitamin E and beta carotene do not protect against heart disease and may even be harmful, according to doctors. Previous studies have suggested these vitamins can keep arteries healthy and can protect against heart disease. But a study by doctors in the United States has found no evidence to support these claims. In fact, they found that beta carotene may actually damage health. The findings are based on a review of 15 different studies, each involving more than 1,000 people, by doctors at the Cleveland Clinic Foundation. They found that people who take beta carotene may slightly increase their risks of developing heart disease or dying early. According to their analysis, people who took beta carotene had a 0.4% increased risk of dying early and a 0.3% increased risk of dying from heart disease compared to those who did not take the supplement. While these percentages are small, the doctors said they were statistically significant. The doctors said the findings applied to vitamin A supplements too, since the body converts beta carotene into vitamin A. 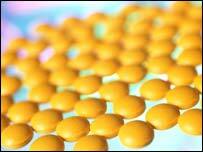 They found no evidence that vitamin E protected against heart disease. Dr Marc Penn, who led the study, said the findings suggested people should stop taking supplements containing these vitamins. "The use of vitamin supplements containing beta carotene and vitamin A, beta carotene's biologically active metabolite, should be actively discouraged because this family of agents is associated with a small but significant excess of all-cause mortality and cardiovascular death," he said. Dr Penn also urged scientists who are carrying out trials on patients involving beta carotene to stop their work. "We recommend that clinical studies of beta carotene should be discontinued because of its risks," he said. The findings come just weeks after the UK's Food Standards Agency issued its own warning about the risks of taking vitamins in high doses. It suggested that taking high levels beta-carotene and zinc over a long period may have irreversible harmful effects. They also reiterated warnings that high doses of vitamin C, calcium and iron can harm health but said long-term damage can be avoided if people stop taking them. The British Heart Foundation said people who stick to the recommended vitamin doses should not be concerned. Judy O'Sullivan, one of its cardiac nurses, said: "Several studies - including the large scale Heart Protection Study - have shown that there is little harm in taking the 'recommended' doses of vitamin supplements. "But we would rather emphasise, to the thousands of people who regularly take vitamin supplements, that there is little benefit in taking them to protect against cardiovascular disease and they should concentrate on adapting a healthy lifestyle and a balanced diet."